It's party time! A very warm welcome to Simply Neutrals number 50 no less! It's going to be a long post, so please bear with me. I started hosting this party when I noticed I was not the only one who missed the whites and greys linky parties we had been part of for some time. Parties that were no longer there to join. That's why I decided to try bring this back to life, at least for my dear blog friends, and all who wanted to join in the fun. It's always been a small group here at Simply Neutrals. We never had a huge number of people joining us. But I really don't mind that, I find it to be a very cozy and supportive group of loving and caring sweeties. That's what kept me doing these parties. To be honest, I don't know how long I will be able to keep it going. I'm really busy with illustration art school. And I hope to build up a career in illustrating, so I'm working really hard to chase after this dream. Which leaves me at the moment (next to family time) with no time left for other things that I love, like doing the Simply Neutrals gatherings with you, my dear friends. So if there is anybody who would like to do these parties with me (or better yet: instead of me), then please let me know! I'd be very happy! This is where my heart leads me and what I enjoy doing the most. So I'm not sure what will happen to my presence on AppleApricot or Simply Neutrals. We'll see. I do know for sure that I have another thing to share with you in the (hopefully nearby) future, something I promised some time ago: an artist interview. When the children's book class is finished (in two weeks from now), I will take that up again. It's a little something I made some time ago, a pouch, to which I added some little goodies. Nothing fancy, just a sweet thank you gift. To join the giveaway, you only have to leave me a sweet comment here below this blog post. It will take me some time to send it though, because I'm in the middle of the busiest and toughest weeks of art school. Since 50 is a jubilee, I thought I'd share with you what made the most impression on me of all these Simply Neutral parties. These are only some of my favourites, I didn't have time to share all of my favourites here unfortunately. But these are the ones that left me speechless. Top left, I'm always stunned by the gorgeous work by Suzy of Suziqu's Threadworks! The rich colors and fabrics she uses, combined with beautiful imagery and lately also more of her mixed media and eco dye work, it's all so yummy! Then top right we have a photo taken by Mascha of Maschas Buch. She takes a lot of stunning photos of beautiful old and weathered buildings. And also of nature. It brings back sweet memories of my travels through Germany. Center right is an example of the gorgeous soldering work by Marie of Lost Bird Studio. She creates such amazingly beautiful pieces of jewelry with her soldering! I love the decorations she does on the edges. My goodness, so beautiful! 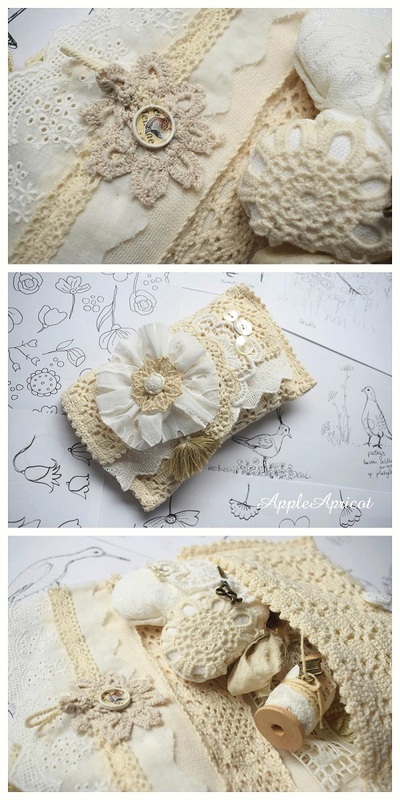 Bottom left is a stunning piece of stitchery work by Pam of Nest in the Attic. I was honestly speechless when I saw this mushroom made by her. And I love the soft greyblue. 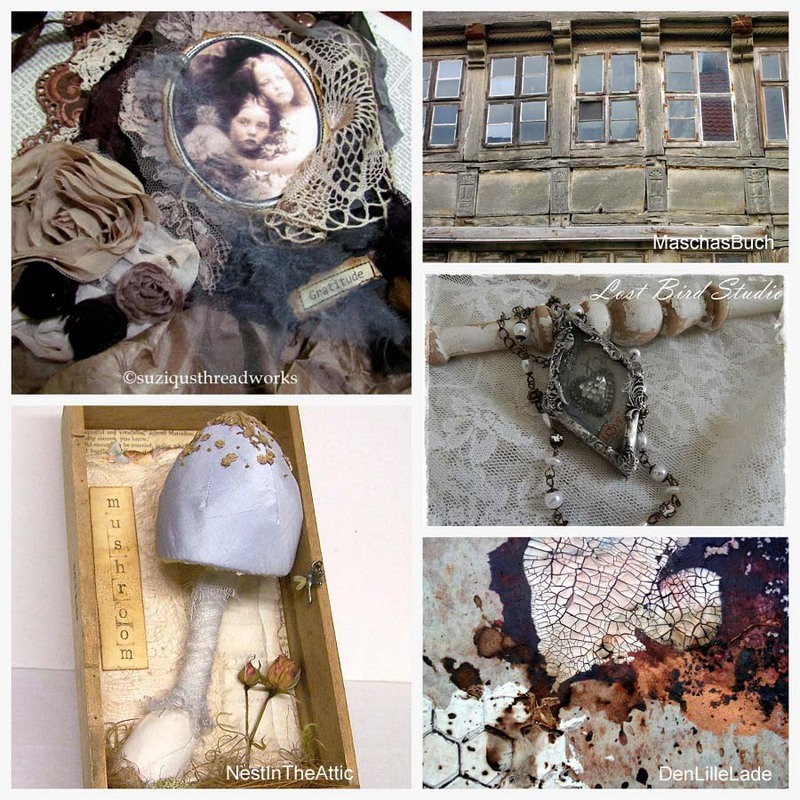 Last but not least bottom right is an example of the amazing textures Dorthe of Den Lille Lade creates in her mixed media work. I'm always stunned by it and very inspired to try different media for texture making too! Like I said, I could have added a whole lot more of the beautiful work you all share in Simply Neutrals! Each time it makes me so happy to see everything you have been creating and willing to share here! Thank you so much for joining and sharing and mingling with each other. I think we have a wonderful little community of beautiful people here, very heartwarming and touching. 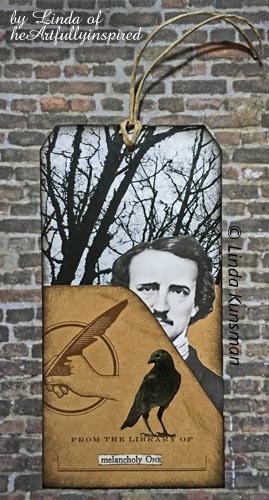 Linda of heArtfully Inspired made this beautiful Poe tag, which I really love. I just had to share it here with you. So poetic! 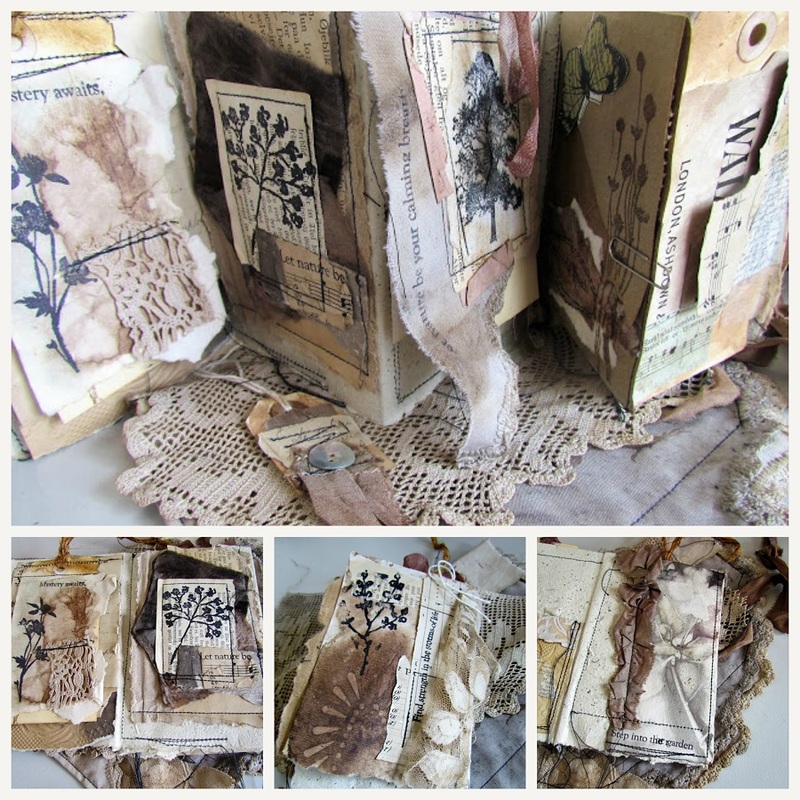 And this month I also had to share Suzy's stunning work, a little book that is close to my heart because of the nature theme, the eco dyed papers and fabrics, and I just love bookmaking so much! Just gorgeous... What can I say more? 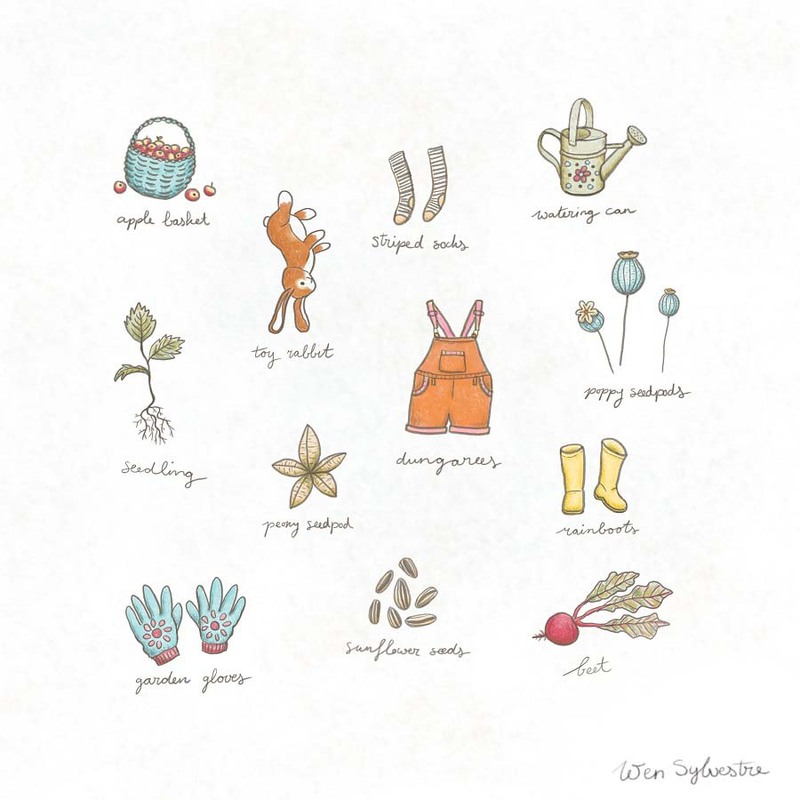 I love ALL your illustrations as well as your sweet blog posts and crafty items! I am going to try to play along with your neutral challenge too! 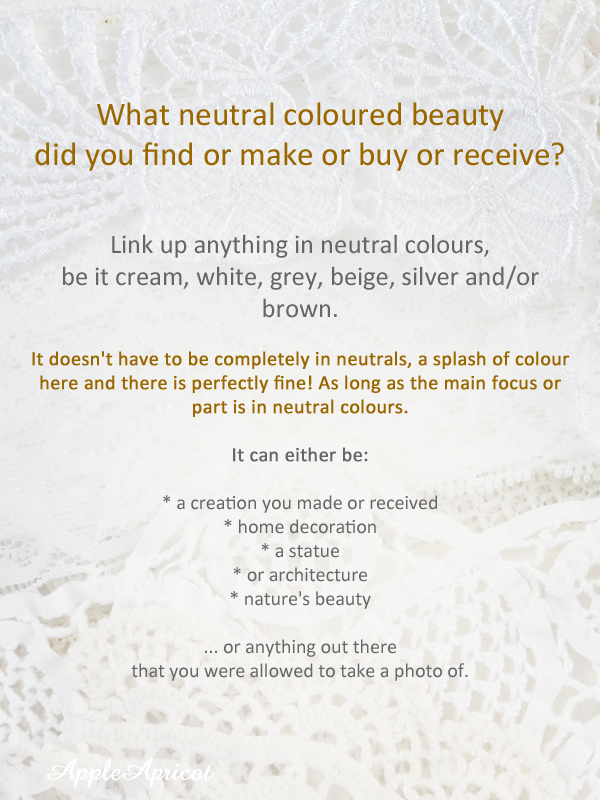 Hi there!As I never do Simply Neutrals I had a look at yours and some of the people who took part but I never made my own blog post. So I don't think I deserve to take part in the giveaway. What I really want to say is that I am amazed by your illustrations and as I love especially children's books illustrations I think you can do really well in that domain. I will follow you on ig. Hugs. AriadnefromGreece! Great illustrations Wen! Wishing you much success with your career! I haven't linked up a post for a long time, the matter is, that I have just a fulltime job with the care of my almost 92years old mother... this made a break in my blogging, only some rare posts and they are never neutrals... Try to come back during next weeks. Ohh Wen your illustrations are so very beautiful! You definitely have a wonderful talent for it and yes you should follow that dream to the end! ...and I'm stunned and honoured that you should include me in your line up of past favourites of yours! Thank you so much! I don't seem to make it in to blog these days but I always read your newsletters. A big congrats to you for going back to school and you have done amazing work with your illustrations, you have a great future ahead of you in that department! I understand how that could take up a lot of your time, but sometimes you have to give up some things in order to move on. Your pouch is just gorgeous and filled with such goodies, Congrats on your 50th post. Thanks for all you have shared with us! Wen, I can't tell you how much I have enjoyed Simply Neutrals! It's my kind of palette! You sound like a very busy gal with your art studies. From what I see you are a very talented woman and if I were ever to author a children's book--which I have considered from time to time--I would want you to illustrate it. I don't care how infrequently you post Simply Neutrals because it's always worth waiting for! Best of luck with all your artistic work. I had a long comment written and then decided to look at your Instagram and lost it all! Argh! I'll try to remember it. Thank you for hosting this Simply Neutrals Party for so long. It's been a major inspiration for my own blogging, and for my artworks too. I love the positive sense of community that's been a part of this artful group of supportive women. 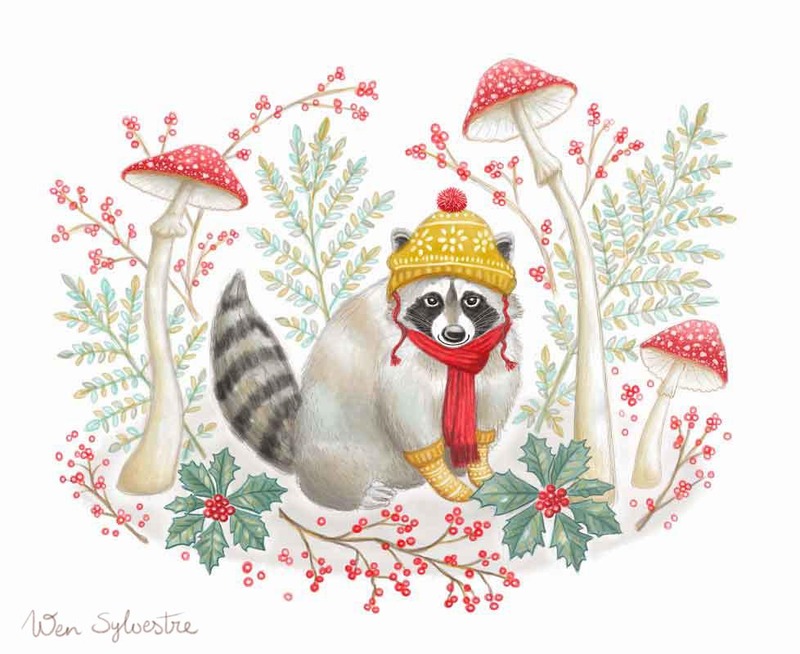 Hello my dear Wen , so beautiful a post for us,- I simply adore your drawings dear friend- The deer are beautiful, and so are the little one with his knitted hat- and your cute girl . You are so talented Wen. Thank you from my heart for showing a piece of creation , by me- it was such a surprice to see me there, together with the talented 4 other. Also love the Poe tag, and Suzy`s amazing creation. 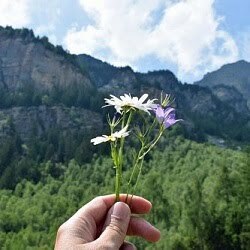 Dear friend, I so understand you want to share or leave this beautiful and wonderful meeting place to someone else with a little more time , and hope there is one whom will help you. I can't draw to save my soul so I'm beyond awed by your charming illustrations. You definitely are on the right track with your career I think. I really wish I had time to help you out with hosting the party but I have too many things on the go at present to even think of taking something else on. I truly hope someone will come forward, but if not perhaps it's not meant to be. I don't 'do' instagram so I'm selfishly hoping you don't give up blogging and will continue to share your creations. Dear Wen what a wonderful 50th post Congratulations to you and to all of us (I guess). I so understand that you wish to follow a new line of creativity with the Illustration Art School. It looks like you may have found your niche. You are so gifted with your illustrations. They seem to come so naturally to you. Love them so much - those beautiful deer, the racoon and the childrens images! Thank you so very much for all of your support in featuring my artwork so often and today also. I feel so honoured! I love today's collage so much - it is so indicative of our parties! I totally understand your commitment to your art and yes there are just so many hours you can give to everything. We certainly appreciate the hours you have already devoted and lets hope thee will be someone to assist or fill your shoes. Thank you for sharing this gorgeous little giveaway. That is so very kind of you dear! Wishing you much fulfillment, love and sending big warm hugs! Wonderful illustrations Wen !! absolutelly lovely. I wish you good luck for your new project. Such a beautiful post . . . your imagination comes up with such lovely drawings and creations. Your blog is a true expression of loveliness. Oh what a lovely surprise to see my tag in this post-thank you! But I am especially happy to celebrate with you even though I have not been a frequent participant.Congrats on 50!!! 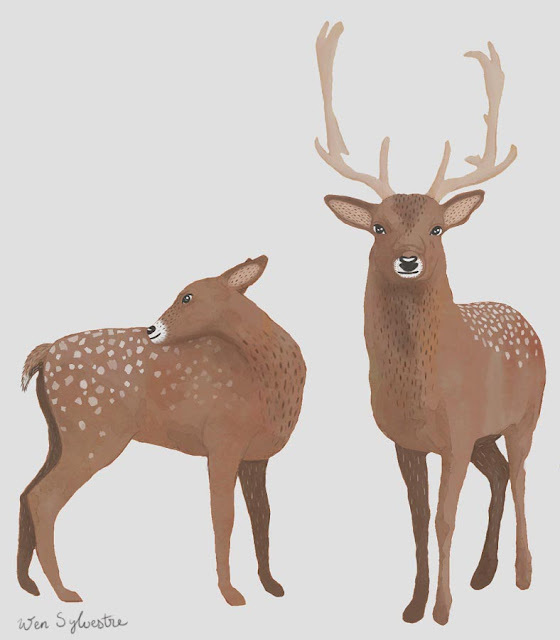 Your deer are so sweet, and I love your wonderful illustrations!! 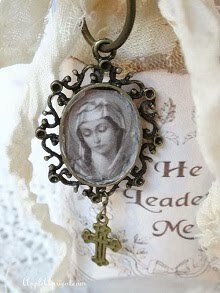 Oh, and your generous giveaway- simply divine- I would so love this!! the vintage, the lace, the crochet work...so beautiful. Thank you for the time you put into keeping this all going . I can see how it must be getting more difficult with your studies and everyday life. Hugs! Congrats on celebrating your 50th Simply Neutrals, I had to find something more or less neutral to join you on this special occasion. 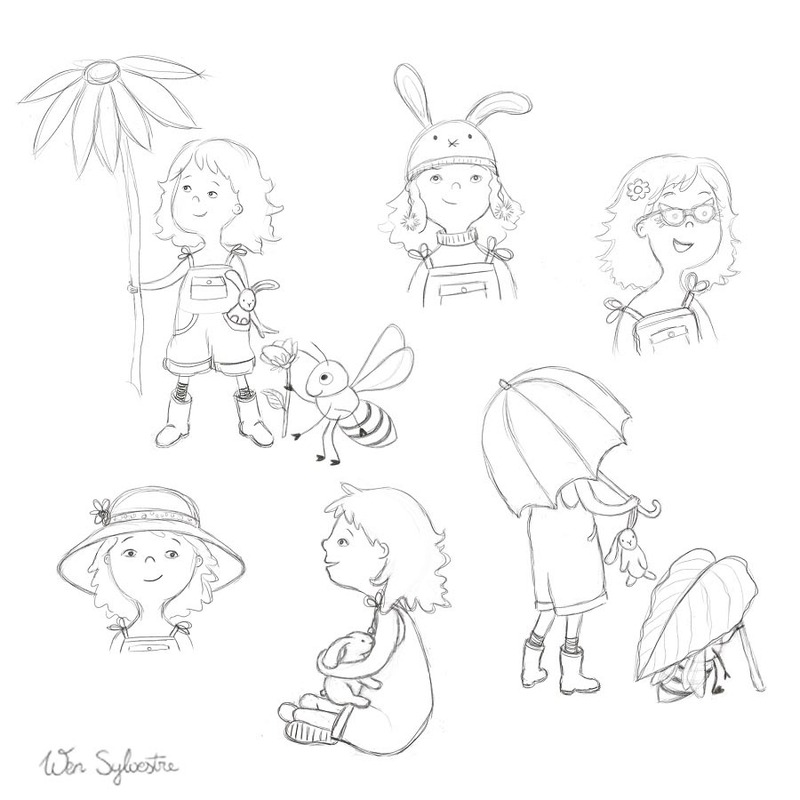 Your drawings are a delight and I´m sure you will have great success in this new adventure. Of course you will have little time for blogging but we all hope to continue to enjoy your beautiful creations when you are able to post. best wishes for the future and thank you for offering such a lovely giveaway. Dear Wen!! Your illustrations are completely and utterly Amazing and gorgeous!! I just love the little girl and that racoon- ho delightful! I look forward to your book! Huge hugs to you my dear friend! Such a lovely post. Your illustrations are simply adorable - full of character and story and ideas. I can see why you want to give over your creative time to this pursuit. Thank you for sharing all those past highlights, as well as this week's favourites - what glorious work all round. I wish I could step up and offer to help with the Simply Neutrals hosting, but I'm about to head into a crazy year - relocating to another country while trying to build new income streams and all of the attendant chaos. I hope there will be a way to continue - having only found Simply Neutrals recently, I'd already be very sad to lose it! I always enjoy my visits Wen, encouraged over by Dorthe all those months ago, such a calming place to sit, gather thoughts and take in the wonderful creativity shared from yourself and the group. I do hope you can find a happy medium as I know how life can turn on a heal and disturb what we love so dearly, even when new adventures are in front of us. Take care.